"In each of these essays the reader is treated to an analysis which highlights important concepts, such as our loss of privacy and the quantification and objectification of our lives. 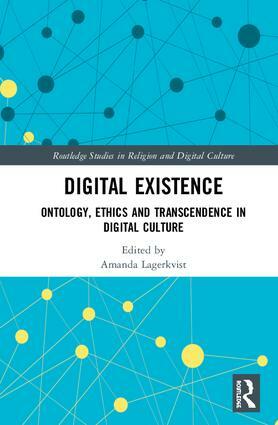 Yet, these essays also give a demonstration of the way that these technologies may provide new forums of addressing important human psychological and religious needs […] this collection of essays offers a fascinating interrogation of meaning in our digital lives." Amanda Lagerkvist is Associate Professor of Media and Communication Studies at Stockholm University, Sweden, and was appointed Wallenberg Academy Fellow in 2013. She is head of the research programme "Existential Terrains: Memory and Meaning in Cultures of Connectivity" (http://et.ims.su.se) in the Department of Media Studies at Stockholm University, funded by the Knut and Alice Wallenberg Foundation, the Marcus and Amalia Wallenberg Foundation, and Stockholm University (2014–2018). She has worked in the fields of media philosophy and media memory studies, and is now developing existential media studies, by focusing on memories of the dead online, after death communication, online mourning and shared vulnerability, the digital afterlife and the transcendence industry. She is the author of Media and Memory in New Shanghai: Western Performances of Futures Past (2013) and the co-editor of Strange Spaces: Explorations into Mediated Obscurity (2009). She is currently writing a monograph entitled Existential Media.